Subcompact sedans have been one of the top choices of car buyers due to their practicality as a city car. 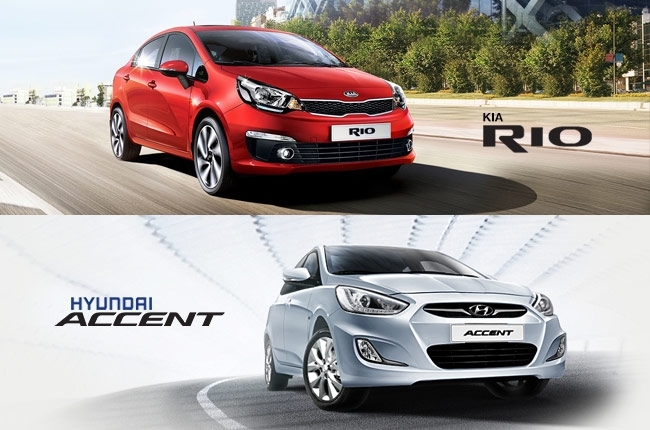 Out of all the locally available models, we pitted the Kia Rio and the Hyundai Accent for a head-to-head spec sheet battle to find out which is the better Korean subcompact sedan. Take note, though, that in order to keep it on the same ground, we took the range topping variant for the Kia Rio Sedan which is the 1.4 EX AT, and then matched it with its closest counterpart in terms of pricing and engine size, which is the Hyundai Accent Sedan 1.4 S CVT. The Hyundai Accent sells at P828,000. It’s a bit higher than the Kia Rio which has a price tag of P775,000. However, this price difference can be due to some advantage of the Accent when it comes to performance, interior amenities, or safety features. With a price difference of P53,000, the Kio Rio takes the first round. Both models run on a 4-cylinder 16-valve 1.4L gasoline engine, transmitted to the front wheel axle, and with a 43L fuel tank capacity. 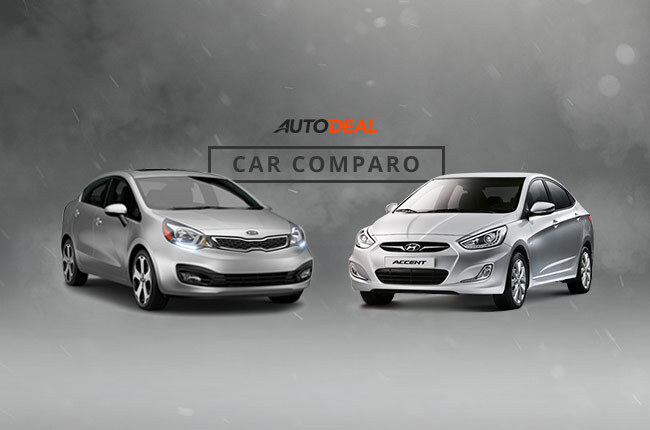 However, the Kia Rio edges the Hyundai Accent by 7 hp and 4 Nm of torque. This could mean a little more power at high speeds and an extra pull during hill climb or when needed. 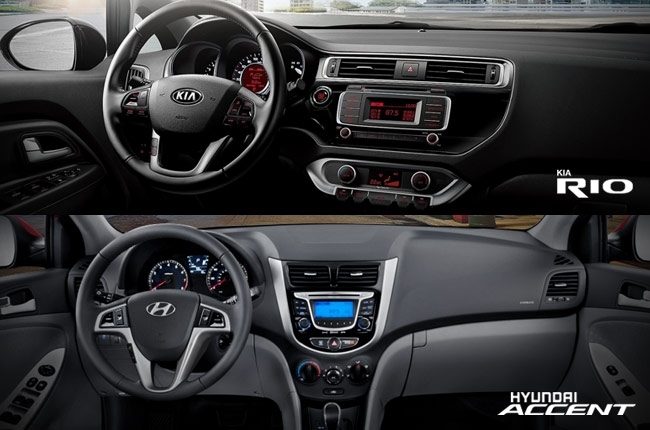 On the flipside, the Hyundai Accent has continuously variable transmission (CVT), as opposed to the 4-speed H-Matic transmission of the Kia Rio. Although it doesn’t really greatly affect the speed of the vehicle, a car that has CVT run smoother than the conventional automatic due to the absence of gears shifting. Moreover, CVT could yield better fuel economy because it keeps the engine within its most efficient operating range. Since the difference in the performance figures is not that quite significant, we’re giving this round to the Hyundai Accent; thanks to its CVT. It’s almost deuce when it comes to dimensions as both cars have the same overall length and wheelbase. 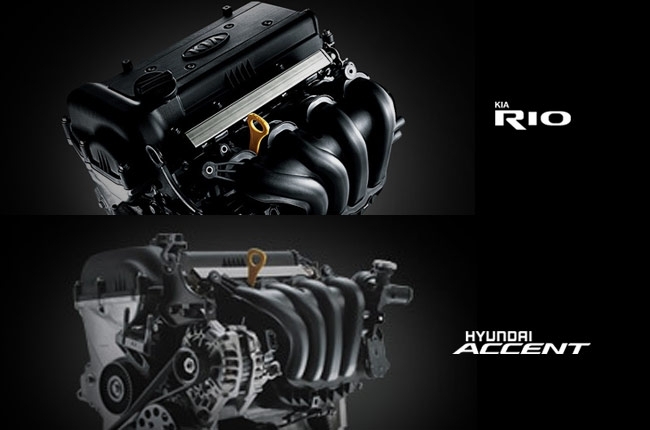 The Rio’s width of 1,720 mm is 20 mm wider, while the Accent’s height of 1,457 mm stands a little higher by 7 mm. It could have been a tie for this round however, the Accent has a bigger trunk capacity of 387L – compared to the 288L of the Rio. This notable difference could mean more groceries or luggage to fit in the trunk. Hence, we’re naming the Hyundai Accent as the runaway winner for this round. 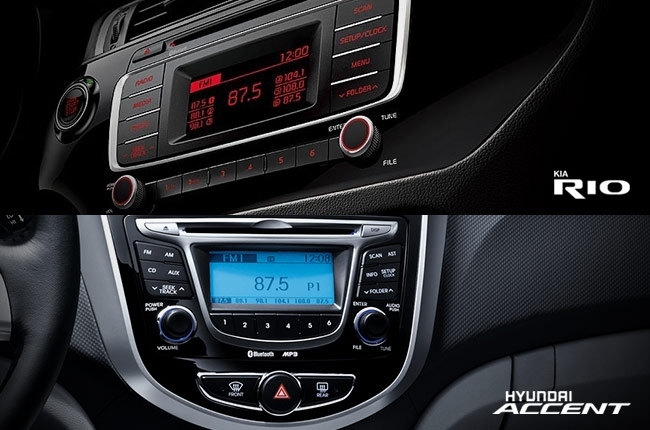 Interestingly, both cars use manual airconditioning, fabric seat covers, power windows, steering wheel audio controls, and 4-speaker 1-DIN head unit with radio tuner, CD, and MP3 with USB and Aux-in connectivity. It could’ve been a deadlock, but the Rio got something up its sleeve to tie this comparo to 2-2 – the keyless entry system. This convenient feature allows you to enter the vehicle, without pressing any button, as long as you have the key within the car’s perimeter. While both vehicles have security alarms and driver airbags, the Kia Rio lacks one for the front passenger. But then again, it has other stuff to make up for that absence that are not present in the Accent. It has Anti-lock Brake System (ABS) that keeps your wheels from locking in case of emergency braking situations. It also has an engine immobilizer that makes your car unusable in case someone breaks into your car without the original keys. With that in mind, this round goes to the Kia Rio. It was a close fight. However, the two cars have their own advantages over the other. If you prefer a smoother drive and a bigger trunk, the Hyundai Accent is your best bet. You just have to pay an extra P53,000 for that. On the other hand, if you want the less expensive one but with keyless entry system, immobilizer, and anti-lock brake system, then the Kia Rio is for you. Besides, yours and your family’s safety is an important factor in deciding which car you should buy.